Welcome to the world of AQUAPIGS. Set up in 1997 by JP (Janice Pacey, PADI Master Instructor), Aquapigs has quickly established itself as one of the areas leading dive schools. Aquapigs mixes a high level of professionalism with a great social atmosphere. Aimed at the 'Young at heart' - our divers ages range from 8 to 80 and an average mental age of about 21 (or at certain times much less!). At Aquapigs safety comes first, but fun comes 2nd, 3rd, 4th and 5th. Taking photographs underwater is seen by many to be a daunting subject. Potentially expensive and sometimes difficult to understand. People are often put off before they’ve even given it a chance, believing that the route to good underwater photography means that they need to spend a fortune and possess ninja like underwater imaging expertise. Alphamarine Photography believe that if you are given the best advice then the initial expense can be minimised, and you won’t spend needlessly to gain a foothold in this fun and rewarding hobby. We'll help you navigate the minefield that is buying an underwater camera setup and once you have it we can provide you with the skills you need to produce great images through underwater photography courses and photo editing workshops we run ourselves near Manchester, around the UK in conjunction with diving clubs and overseas. Underwater photographic specialists Cameras Underwater Ltd have been trading for over 20 years. Suppliers of a wide range of equipment, Cameras Underwater offers friendly advice with expert knowledge on every aspect of underwater photography. We sell cameras, housings and strobes, as well as optical and other accessories to all parts of the diving industry. We have an extensive website listing many manufacturers. However, should you not find what you’re looking for just contact us at sales@camerasunderwater.co.uk and we’ll source it for you. Fin Divers is the brainchild of Matt Bacon. Matt decided after years of diving around the world, his dive buddies although qualified, were more often than not, inexperienced. Spending too much time looking after your buddy rather than enjoying the pleasure that is diving, all got too much. So, Matt set up the Fin Divers you see before you today! Fishinfocus underwater photography exists to help you get more out of your underwater photography. Join award winning photographer Mario Vitalini and start taking better photos. From complete starters through to serious amateurs, we are able to support you with a complete and flexible range of courses for all levels. We offer practical knowledge and honest advice you can trust alongside a carefully selected range of cameras, housings and accessories. We quite literally breathe underwater photography… and love any opportunity to help make taking incredible pictures underwater all the easier and more fun. Nick and Caroline Robertson-Brown are a husband and wife team of underwater photographers. We both have degrees in biology from Manchester University, with Caroline also having a masters in animal behaviour. Nick has a Associateship from RPS in underwater wildlife photography and he also has a masters in teaching. We are passionate about marine conservation and hope that our images can inspire people to look after our seas and oceans. Frogfish Photography, based in Manchester, offers a wide range of services and advice. We offer tuition with our own tailor made course - the Complete Underwater Photography Award. The modules of the course have been written to complement the corresponding chapters in Nick's own book: Underwater Photography Art and Techniques. We also offer equipment sales, underwater photography trips in the UK and abroad, as well as writing for Sport Diver and Wild travel magazines and undertaking photography commissions. Please have a look around our website for more details on what we do, the Frogfish Photography latest news, as well as having a look as some of our images in the gallery. Please contact us if you have any questions - we are happy to help. We are very proud of the photographic services we have provided over the years. The Island Photo Centre has been established for over 20 years and is the largest independent photographic retailer on the Isle of Wight. Mike’s Dive Store is not about shifting boxes of product but having the patience to understand the particular needs and wishes of every one of its individual customers. That’s you! There are very many aspects to the underwater world and Steve has seen most of them. He instils in his staff this philosophy to only sell the right tools for the job and many of the currently regular customers will tell you that it was Mike sold them their first set of diving equipment. Mike may have passed away but Mike’s Dive Store is alive and well, and Scuba Steve is carrying on the traditions that Mike established for it. Whether you are a seasoned UK diver or a warm water diver, we believe that Ocean View have something for everyone. Even if you are a diver and your partner is not, you can be sure that everyone will always be made welcome to the “Best Dive Club” in the land! We are a unique scuba retailer recognised for choice, value and convenience. 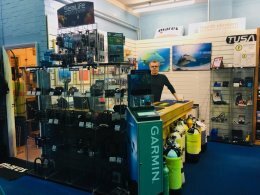 We sell, service and hire, general scuba products for the diver, Our store in Bishops stortford was built on values and standards that we have as divers ourselves. We are Hertfordshire,Cambridgeshire and Essex's most established dive shop and conveniently based Just off J8 M11 and offer the full range of PADI scuba diving courses and great value equipment. Planet Scuba is owned and managed by Stephen Manton, All courses are run to the highest standards with our team of experienced PADI Instructors. Seaways is a BSAC Dive Centre of Excellence #0491 and instructs diving in accordance with the current syllabus of the British Sub Aqua Club. The business focuses on compact camera solutions. We currently limit the number of manufacturers so we can offer the best service and price. Our major supplier is with Inon due to their great compact camera solutions. At Underwater Visions we, probably much like you, live for underwater photography. 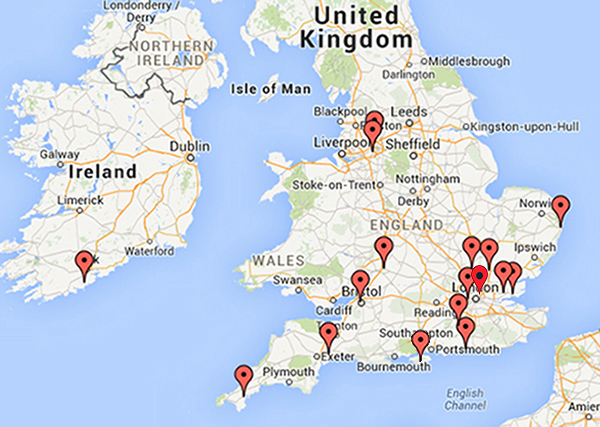 We welcome any opportunity to dive with like-minded people in the UK. If you want to see any of our products and don’t want to venture to us on the Dorset coast, simply contact us, propose a good dive spot, and we’ll meet you there. You’ll then be able to ‘test-shoot’ a model before making any decisions. We know from our own experience as underwater photographers that buying an underwater camera system is a significant investment that requires much research and reflection. We are only too happy to provide you with any advice to assist you and information beyond that in our website. Now you are here, why not visit our catalogue for full details of our product offerings, enjoy a visit to our image gallery, and check our support pages for more details about our product support, service options, and terms and conditions. We also offer underwater photographic workshops in the UK and overseas where you’ll also have the opportunity to test our products before making any purchases.